Embossing....which to choose for a card?? What I love about Brutus Monroe is the way the products spark out of the box creativity. I am super excited to be the August guest designer on the Brutus Monroe Inspiration team. For my first project I wanted to use all of the above. For today's card I started with a sheet of Brutus Monroe masking paper. Using a pencil I drew three hills and a tree branch. 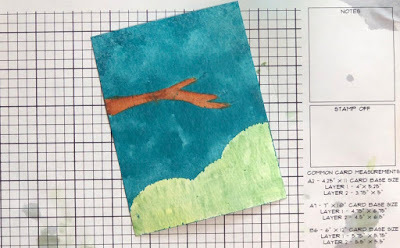 After cutting out the hills and branch I placed them on a piece of watercolor cardstock. Next, I placed the panel in a tall box so I could spray Oz Surface Spray on the panel. Surface sprays come in a variety of colors and dry permanent. The bold blue color of the Oz was perfect for my sky. 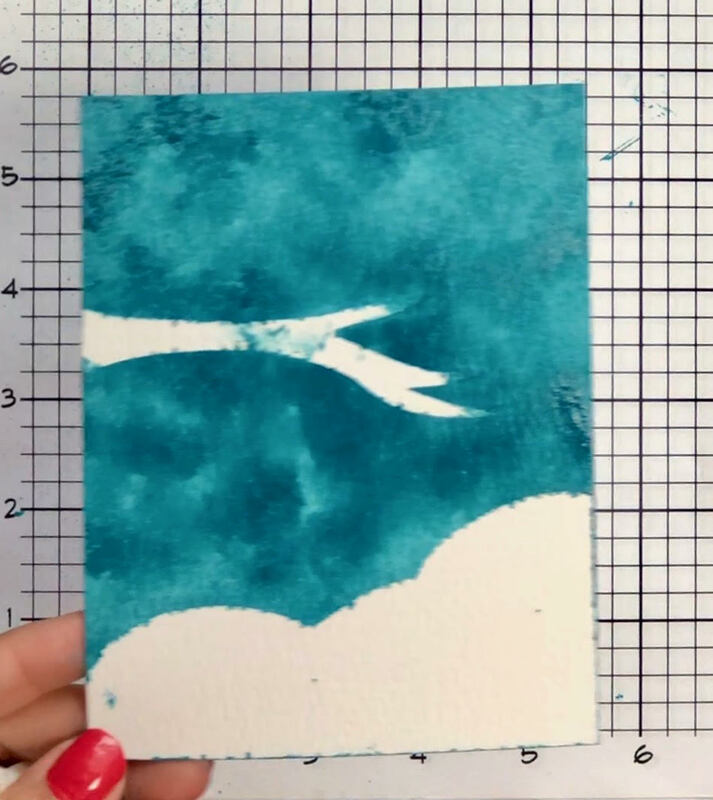 To add varying dimensions I used a paper towel to blot the surface spray. You will need to work fast due to the surface sprays drying quickly. After blotting the surface spray I removed the masks. Stain and Maple and Terracotta for the tree branch. Surface inks are great for watercoloring! I smooshed each color onto my surface and added a spray of water then using a paint brush I watercolored the hill and tree branch. To give the grass a textured look I made strokes going vehicle on the panel using Envy ink. 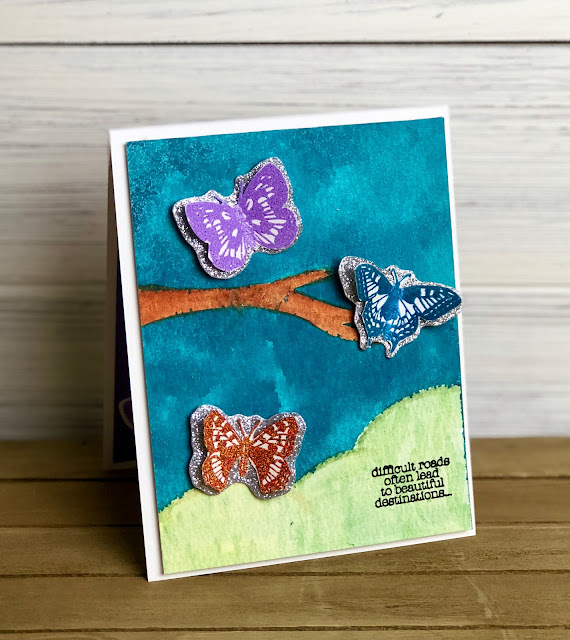 I used the Butterfly Sentiments 2.0 stamps and dies for the focal point of the card. This stamp set is wonderful. It includes the shadow and detail stamp for the butterfly. You can do so much with this one stamp set. 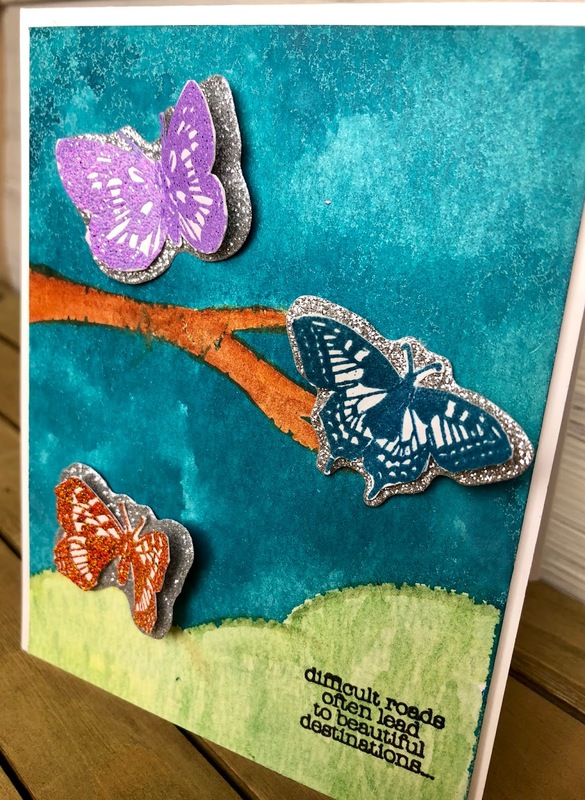 I decided to heat emboss three butterflies using Brutus Monroe embossing ink and the following gorgeous embossing powders: Tangerine Twist, Grape Soda, and a color I made myself inspired by the Brutus Monroe Embossing Bar at the Studio Store in Pittsburgh, mixing Icicle and Mermaid Tail. Once each butterfly was heat embossed I used the coordinating die set to cut each butterfly and the shadow out of Sterling glitterstock. 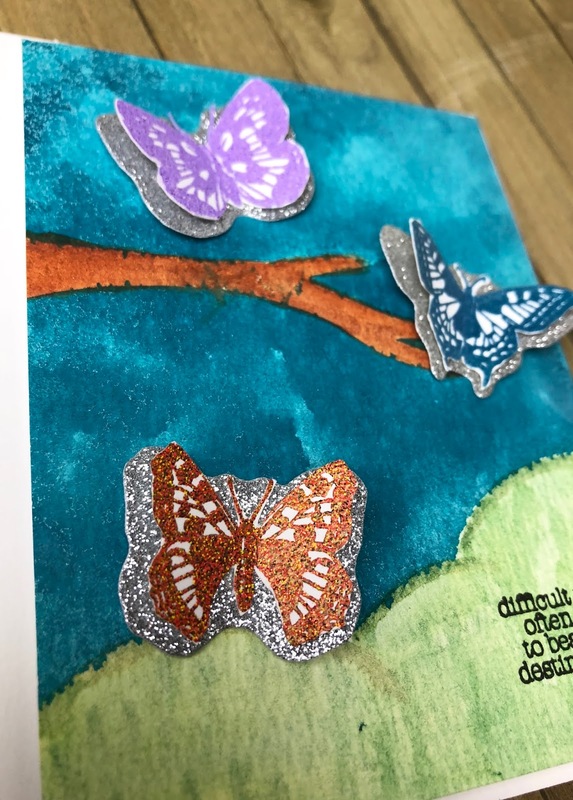 Due to the die cutting the same size I fussy cut the embossed butterflies so you could see the "shadow" of the glitterstock. This gave the butterflies extra depth. i also gently folded the butterflies so their wings are not laying flat on the background. Using score tape I attached the butterflies to the glitterstock and attached them to the panel. 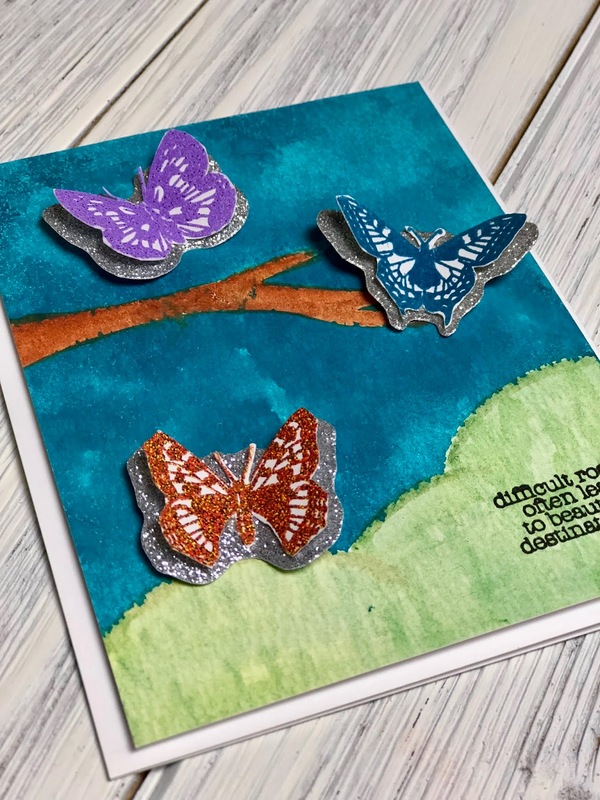 The Butterfly Sentiments 2.0 stamps has four amazing sentiments. 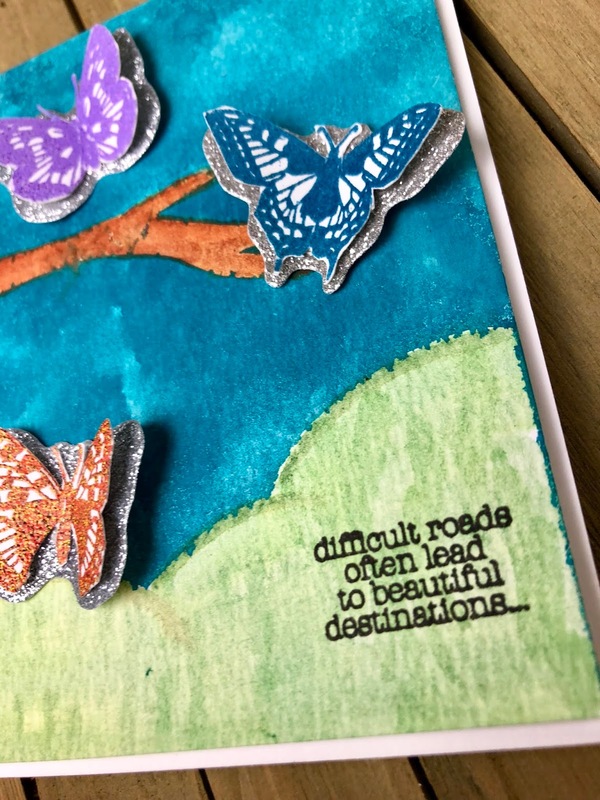 I choose the sentiment that says difficult roads often lead to beautiful destinations... stamped in Brutus Monroe Detail Raven ink and added a second sentiment from the set for the inside of the card. I had a lot of fun being creative with so many different mediums. I encourage you to stretch your projects and mix products and mediums you may not have tried before. Experiment and see what happens. "Create your own ending!"